VW Group increased its employee count by 12% during the period. Car-industry employees concerned that robots will put them out of work need not worry -- at least for now. Automakers in China and other emerging markets, where growth is strongest, favor human labor because it requires less upfront investment, said Steve Man, an analyst at Bloomberg Intelligence in Hong Kong. In developed markets, tasks that can be handled by robots have already been automated years ago and automakers are now boosting hiring in r&d as the industry evolves. A trio of Chinese automakers, SAIC, Dongfeng Motor and BYD -- in which Warren Buffett is a major investor -- increased staff by at least 24 percent. Volkswagen Group accounted for more than one in five jobs among the group of 13, and increased its employee count by 12 percent in the period. 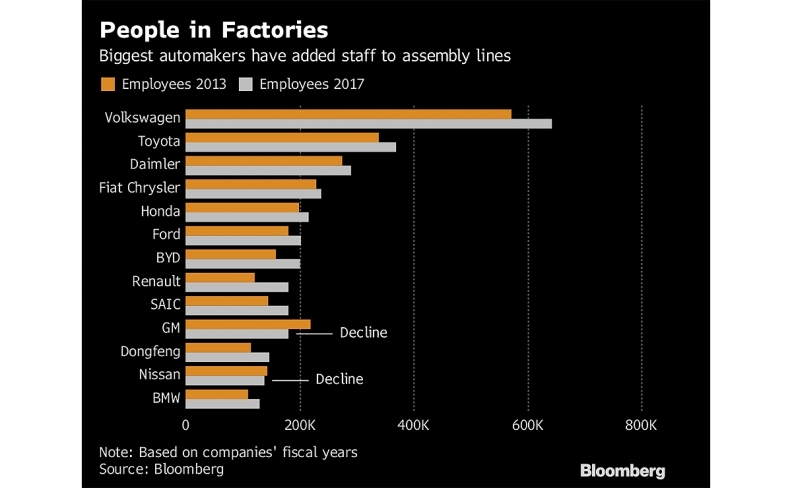 General Motors, which shrank its payroll 18 percent to 180,000, and Nissan Motor, which contracted by 2.8 percent to 139,000 workers, were the sole automakers whose staffs got smaller, the data show. But GM’s numbers were affected by the sale of its European division to PSA Group last year.